Sam Pacetti’s first CD, Solitary Travel, was released nearly ten years ago, when he was 22. 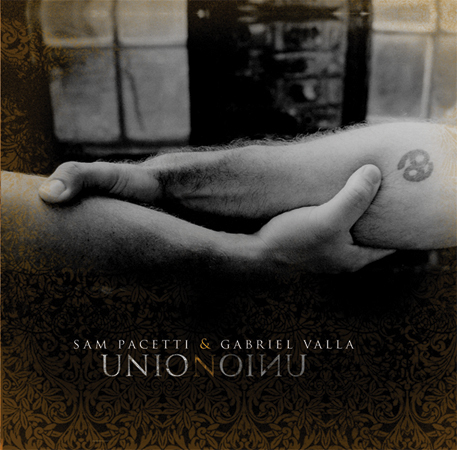 It got airplay on NPR, Sam was voted best new artist at the Falcon Ridge Folk Festival, everything was in place for a grander success, and… Pacetti disappeared. Well, not if you lived in St. Augustine, Florida, where he performs Monday nights at the Mill Top Tavern, and there was an occasional Southern festival gig. A poor quality soundboard CDR recording “Live at the Mill Top” showed the man could still make a steel-string guitar catch fire and burn. He hung some drywall and did some surfing, but the real journey involves the simple truth that no matter how much the world loves you, if you don’t love yourself you have no home. This recording reflects that journey, through loss and rapture and loves too fragile to survive, all the more passionately embraced. Somewhere along the line, Sam became an extraordinary interpreter of other writers’ material. Needless to say, Union is beautiful, and for the most part Sam and musical compadre Gabriel Valla’s guitar parts are presented more in support of the songs than as showpieces for their prodigious instrumental skills: “Ft Worth Blues” is Steve Earle’s poignant tribute to the life of Townes Van Zandt; Leslie Smith’s “Dark Horses”, which I’ve always thought of as the Waterbug anthem, comes from her first cassette recording: “there’s a somewhere in the sun Where the dark horses get to run.” Gabe Valla sings lead on Kate MacLeod’s classic “Lark in the Morning”; the two make a picker’s feast of “Wildwood Flower.” “Augustine” is one for the repeat button, a soaring, gorgeous melody, tracing the prodigal’s return to the Goddess. Michael Smith’s “There” closes, stating so elegantly that all we need for love and wonder is already in our hands. Yes, indeed. And welcome home. -AC 1.